Secretary of State Mike Pompeo unloaded Friday on his Obama-era predecessor John Kerry for “actively undermining” U.S. policy on Iran by meeting several times recently with the Iranian foreign minister, who was his main interlocutor in the Iran nuclear deal negotiations. 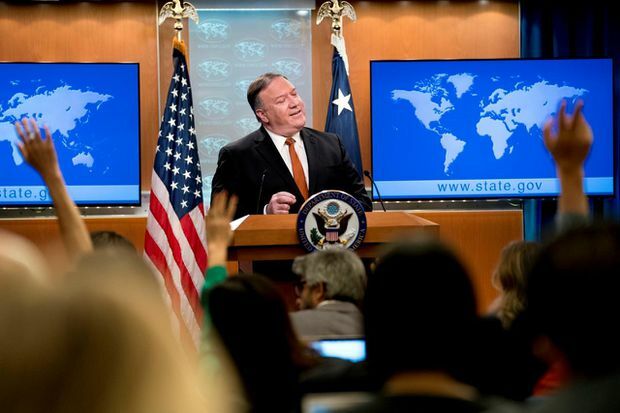 U.S. Secretary of State Mike Pompeo speaks at a news conference in the press briefing room at the State Department in Washington on Friday, Sept. 14, 2018. Pompeo says his Obama-era predecessor John Kerry has been 'actively undermining' U.S. policy on Iran. Kerry, who is promoting his new book “Every Day is Extra,” tweeted a response to Trump that referred to the president’s former campaign chairman, Paul Manafort, who agreed on Friday to co-operate with the special counsel’s investigation into Russia interference in the 2016 presidential election and possible co-ordination between Russia and the Trump campaign.